She is so strong, she can be completely vulnerable. Some of her songs, like this one, “Dry Land,” make me weep without tears. She is rough and imposing and yet tells such wondrous tales of the heart. Never has there been another song that describes a yearning for true love with such piercing beauty. The song turns on the metaphor of being long away to sea. She craves peace and calm in the object of her love. Her singing aches with desire. She asks to touch the soul of another. But, surprisingly she says, “maybe” she will bring a gift of love. There is, even in this deep passion, a hint of reticence. And this guardedness is of a piece with the remainder of this album in which she talks to or sings about another person, who in two instances is named Jesus, and she has been rebuffed more than once and is clearly wary of reaching out. 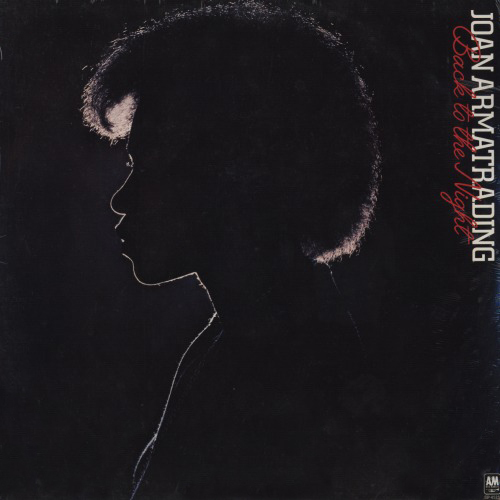 From one song to the next, from one album to the next, Joan Armatrading explores great diversity of style and arrangements that range from her solo guitar or piano to an ensemble that seems to embrace all humanity. At times her voice is deep, almost growling, and then she quavers high and pure. While the songs speak of a spiritual longing, they arouse numinous understanding in those of us lucky enough to listen. It is possible to interpret this album, Back to the Night, as an allegory for a Christian spiritual journey. But I think this album is response to a troubled relationship or unrequited longing. The religious yearning she invokes is, I think, metaphorical. Yet I feel she is calling us all, as privileged companions on her quest to understand the true nature of human love. Joan Armatrading and Pam Nestor, “Dry Land,” Almo Music Corp./Essex Music Inc. (ASCAP) (1975). From Joan Armatrading, Back to the Night, A&M Records, SP 4525 (1975). Art direction – Fabio Nicoli; Photography – Clive Arrowsmith.